On May 1, 1903, the first Labor Day celebration in the Philippines took place. It was organized by the Union Obrera Democratica de Filipinas, the first labor federation in the country. Thousands of workers marched from Plaza Moriones in Tondo to Malacañang to demand complete independence, while chanting anti American capitalism and imperialism. On May 1, 1898, the naval battle between a squadron of the United States led by Admiral Geroge Dewey and a Spanish fleet under Admiral Montojo took place in Manila Bay, destroying the Spanish fleet. Soon after, the Spanish Governor-General intimated his willingness to surrender Manila but Dewey had no enough force to occupy the city. On May 1, 1954, Ferdinand Marcos and Imelda Romualdez were married at the Pro Cathedral of San Miguel in Manila, after being married in a civil ceremony in Baguio City. Though they seemed an unlikely match, Marcos being a Liberal and an Ilocano and Imelda being a Nacionalista by family tradition and a Waray-waray, he pursued her. On May 2, 1902, on urgent recommendation of the Philippine Commission, the US Congress passed an act authorizing a coinage system for the Philippines with a standard Philippine dollar, or "peso", worth fifty cents of American money and exchangeable at government treasuries for this amount. On May 3, 1859, Enrique Mendiola, educator and textbook author, was born in San Miguel, Manila to Quintin Mendiola, a blacksmith, and Maria Escolastica Victorino. On May 4, 1917, Nicomedes "Nick" Joaquin, historian, journalist and a National Artist of the Philippines for Literature who is also widely known with his nome de plume Quijano de Manila, was born in Paco, Manila. On May 5, 1869, Fabian Cueto de la Rosa, regarded as foremost Filipino painter during the American period, was born in Paco, Manila. 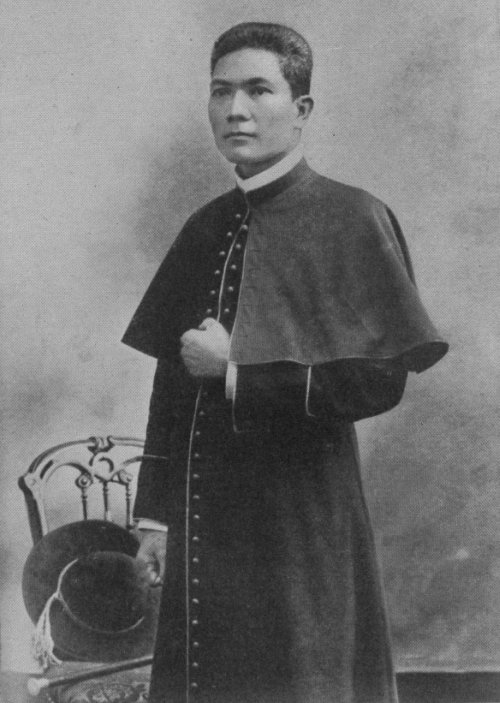 On May 5, 1860, Gregorio Aglipay, the forefront in the creation of an independent church called the Iglesia Filipina Independiente and a nationalist former Roman Catholic priest, was born in Batac, Ilocos Norte to Pedro Aglipay Cruz and Victorina Labayan Hilario. Orphaned at a young age, Gregorio grew up in the care of relatives. As a worker in the tobacco fields, he learned about the social condition under the colonial masters. He was only fourteen when he was arrested and brought to the gobernadorcillo for failing to meet the required quota of tobacco. Because of this, he developed a deep resentment against the Spanish authorities. On May 6, 1942, Corregidor, the strongest fortress of the United States in the Orient, was surrendered unconditionally to the Japanese army. Following the earlier surrender of Filipino-American forces in Bataan, General Jonathan Wainwright decided to surrender his remaining forces of about 12,000 men in the island. On May 6, 1662, a council presided over by Governor-general Manrique de Lara resolved to abandon the fort of Zamboanga, La Sabanilla and Iligan in Mindanao, and Ternate in the Moluccas and ordered its troops to withdraw to Manila. The concentration of Spanish forces in Manila was in hurried preparation for its defense due to the treat of invasion of Chinese corsair, Koxinga (or Keu-Seng). The fort of Surigao, then called Caraga was the only one preserved. On May 7, 1892, Private Tomas Mateo Claudio, a former Bureau of Prisons employee, the first Filipino soldier to die in First World War was born in Morong, Rizal. On May 8, 1980, Senator Benigno Aquino Jr., a political prisoner, a staunch critic of the Marcos administration, was allowed to leave for the United States to undergo a coronary bypass surgery on recommendation of his doctors at the Philippine Heart Center where he was confined after suffering a heart attack in his prison cell in Fort Bonifacio. He was immediately transported to the center on the evening of May 5, 1980. On May 8, 1967, Republic Act No. 4867 was passed into law. It divided the Province of Davao into three provinces namely Davao del Norte, Davao del Sur and, Davao Oriental. The capital of Davao del Norte is Tagum; Davao del Sur, Digos; and Davao Oriental, Mati. All three provinces are in Region XI.